I did my second book signing, for my temple this time. As part of the gig, I prepared several items from the cookbook for people to sample. 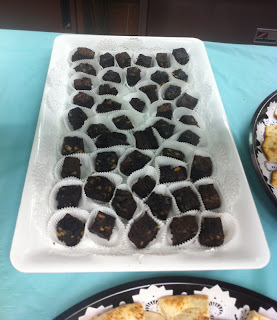 The items change depending upon the location and logistics (for example I had to cook everything at the temple several days before the event), but for each event I whipped up a batch o'brownies. Wait ... what ... did you say brownies? Yes, you heard correctly ... brownies. Brownies in a slow cooker? 2. why in a slow cooker? 1. They are very good. 2. In case your oven is occupied by something else, or it's summer and you don't want to fire up the oven, or you forgot to pay the gas bill again. The Kosher Linkup Challenge this month is to make anything in mini-size. My canape contribution happens to start and end as a miniature. 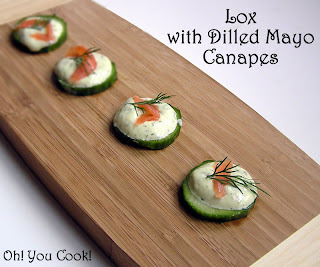 But if anyone says that makes 'em a cheat, simply think of them as mini version of lox and bagels, hold the bagels. The base of the canapes is (are?) slices of English cucumber. English cukes are not coated in wax; to extend their shelf life they are wrapped in plastic. This no peeling makes them very appealing, not only saving you the precious 30 seconds per cuke but almost guaranteeing perfect pleasing circles to build upon with whatever. Leftovers, if any, can simply get tossed in a salad. Regular lox is very salty; cut the lox in very narrow widths to cut the salt. If you use nova, be more generous in each serving.